The museum integrates a small 30-seat theater which is equipped with a digital video globe. 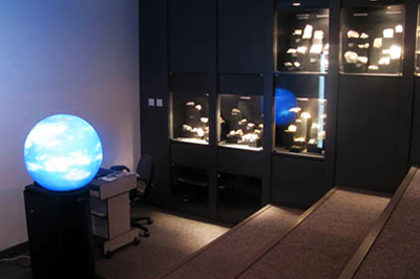 This unique digital display presents global information on a sphere-shaped screen. This makes it easier to intuitively understand the global Earth's dynamic systems, whether it be climate, plate tectonics, ocean currents or atmospheric motions.The Magic Globe can only be viewed under supervision during a guided tour visit.